Unless you are living under a rock, you would have undoubtedly heard a lot about malware and cyber attacks that plague the internet users across the globe. Here are some of the best practices to prevent malware/cyber attacks and secure your online privacy. Also, we will discuss the importance of antivirus software in protecting your computer. Create a complex password that can be easily remembered by you. Think of something that is meaningful to you, and use a combination of letters, numbers, and symbols to create your password. Do not use words that are found in Universal Dictionaries since they are vulnerable to hacking or password cracking. Don’t forget to change your password regularly. Make sure to change your password at least every six months. Never share your passwords in response to an email request or any fraudulent email messages or phone calls. Never save your password when prompted by your browsers or any other programs. Though it is useful for quick sign-ins, it makes your passwords more vulnerable to hacking attempts. Many cyber attacks are based on known vulnerabilities in software applications, as well as in operating system and plug-ins. Therefore it is critical for you to patch your software applications as and when the patches are available. Keep your installed software and operating system updated. 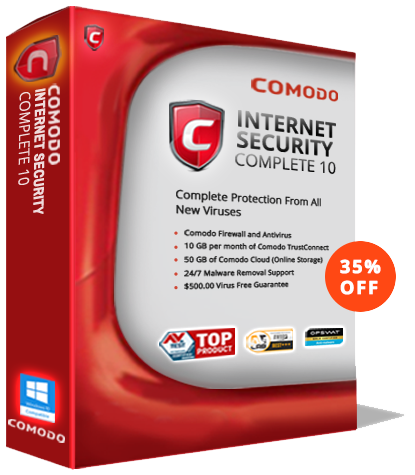 Anti-malware or anti-virus software such as the Comodo Antivirus is an essential part of your computer’s security system. Make sure that you have Comodo Antivirus installed and is running the most current version on your computer. Always keep your antivirus file definition and security patches up to date. Once viruses or any other malware programs are detected, the Anti-virus application recommends you what to do, or it will remove them automatically. Take note of this: do not run two or more anti-virus programs simultaneously as this may cause your computer to have conflicts, fake-positives, and even system crash. Make it a habit to regularly backup your data. Doing the regular back of important files is a preventive measure you must take. In case of a malware infection such as the ransomware attacks, you can easily reinstall your software and restore your data. However, this calls for a smarter backup strategy such as offline and cloud backups. By having a backup of your important files, you can safeguard your precious data from ransomware scams. Even if targeted, you don’t have to worry about the threats posed by the cybercriminals. Never install random software that popped up on your computer screen. Unless you have enough knowledge about the software and you have purposely installed it before, do not install it. Do not click on suspicious links or websites. Whether the links are given by a friend or from a trusted site, always make sure to double check it to avoid inflicting any risk on your computer. Popups are both annoying and malicious at times- redirecting you to malicious and fake websites. Enable popup blockers on your web browsers to avert unwanted or misleading advertisements, popups, and other browser malware that leads to ransomware infection. Enable Personal Firewall on your computer to monitor all inbound and outbound traffic to a computer system. Having an up-to-date antivirus program on your computer can help secure your computer as well as your online privacy. Download Comodo Free Antivirus software today! How Android Virus Scan Protects your Devices?